Goddess Ink’s newest offering, Stepping Into Ourselves: An Anthology of Writings on Priestesses is a colorful tapestry of voices illuminating the roles and perspectives of priestesses in the ancient and modern worlds and weaving them together to create the beautiful fabric of women’s sacred service. The personal essays, academic articles, poetry, rituals, and tools in this book will speak to your heart, inspiring you to step into your own spiritual authority. 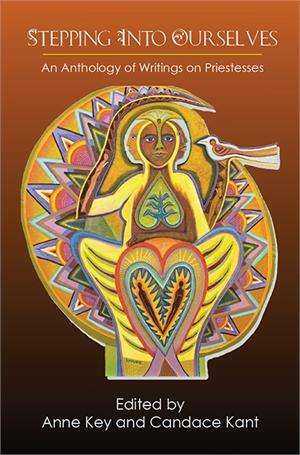 Featured in this rich anthology of over 500 pages are works by over 50 authors, including Layne Redmond, Normandi Ellis, Patricia Monaghan, Johanna Stuckey, Jalaja Bonheim, Ruth Barrrett, Shekinah Mountainwater, Kathy Jones, Vivianne Crowley, Asia Shepsut, Jill Hammer, Linda Johnsen, Leilani Birely, Pamela Eakins, Vajra Ma, Mary Moonbow, and a host of other powerful women. This book is like a luscious and well-appointed buffet dinner: scholarly essays, juicy stories, and thoughtful reflections, personal poems, songs and prayers. It is quite a satisfying meal! -- Vicki Noble, co-creator of Motherpeace, author of Shakti Woman and The Double Goddess. Enter this rich labyrinth of wisdom prepared to review every aspect of your own calling as a priestess. -- Holli Emore, Executive Director of Cherry Hill Seminary.